Fallout 4: Welcome Home... to the Review! 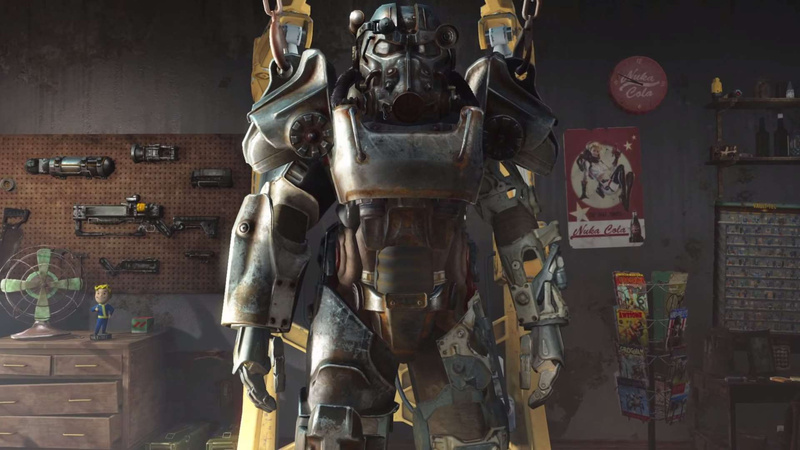 » Fallout 4: Welcome Home... to the Review! Not everyone is a fan of RPG titles, but those that are should certainly look into Fallout 4 if they haven’t already. In a sense my article is slightly biased as I live on the outskirts of Boston, traveling through ruined cities and hearing the tales of what happened is overwhelmingly fun for me. While I knew the game would be placed in Boston, I didn’t expect it to include many of its surrounding cities, but indeed it does. While my beloved cities aren’t recognizable at first glance, the scenery offered landmarks that were undeniable and it helps that the AI often talks about the area you’re in. One thing about Fallout is the way the Developers combine the 1950’s with the incredibly far future. Granted it is an alternate future so it is easy to mix and match different eras, but there’s something S.P.E.C.I.A.L. about the way Fallout 4 does things. Futuristic yet primitive is really what I’m getting at here. You won’t find shiny up to date machinery in Fallout 4, quite the opposite really. While the equipment you come across is certainly high tech and powerful, you’ll find the majority is parts and pieces look like scrap metal put together to build unexpectedly powerful weaponry and protection. So why is the future so glum? Well because of the apocalypse of course! Mankind and its constant need for power has ultimately become the world's undoing. Drop a few nukes around the world and you get the Fallout series. While there is a great and deep storyline, it's difficult to explain without spoiling it so, take what you've read so far with a grain of salt as I’m not going to spoil anything. I am simply going to give you a few “need to know” descriptions. There are (and always have been in the series) bugs in Fallout 4 that can be overlooked easily enough. Characters that begin to act erratically after speaking with them or enemies that have managed to walk around with only the upper half of their body attached, but none of it is game breaking or even that common. At its worst, you’ll scratch your head and try to make sense of what you’re seeing. Set those little bugs aside (though reports on Xbox One say it’s not as simple as that) and you have yourself a masterpiece. Graphics are crisp and beautiful. Video games have been evolving graphicly for years and it still surprises how amazing some of them look. While some gamers will argue that graphics mean nothing when compared to a great story, I like to argue the opposite in this case. What would a great story about the apocalypse be without a great visual of art to help pull players in? The reality is without good graphics, you won’t have a good game. Graphics are more than pretty scenery, the graphics are part of the story. An artist has put in a lot of work to help you see the vision behind the storyline, so take a minute to appreciate what you’re looking at, it's worth it! Audio is smooth between music and FX all the way around. Tune your radio to listen to some classic music or keep up with local news broadcasts. If you’d rather not you can always turn the radio off, but it's recommended to check into once in awhile, especially if the hud lets you know you’ve picked up a new frequency. You can hear player movement and even a change in the winds, if you’re using a headset with surround sound, there's just no better way to experience it. You can create your character to look as you wish and roam the wastelands fully protected in some power suit armor or run around in your undies in the rain like you’re reenacting a scene from The Shawshank Redemption. You’ll need to craft items, weapons and houses that includes beds for your shelters. Join or destroy factions as you move along Beantown, and listen to the stories the characters are willing to share. Leveling up can increase your health, intelligence, charisma, so on and so forth. It also offers you perks to enhance current or add abilities that you don’t currently have. Fallout 4 offers over 100 hours in its initial playthrough (depending on how you do or do not skip) and has a very high replay value. For $30.00 USD you can pick up the first season pass in the Fallout series that will include 4 DLC drops and will extend the experience. The most important part in Fallout 4 is the ability of choice. You may be the hero or the villain, merciful or merciless and how you decide to play will make things easier or a struggle. It's all about freedom of choice, so let us know how you go about making those choices! Is the story over when I chose the one I want to help.I chose the brotherhood once then I chose the institue.seems like the game ends the.